Lora Mae Findley, 97, passed from this life into the arms of Jesus on Wednesday October 24, 2018 at Good Samaritan Society in Wood River, NE. Funeral services will be 10:30 AM, Monday October 29 at St. Paul’s Lutheran Church in Grand Island. Visitation will be from 5-7 PM, Sunday October 28 at Livingston-Sondermann Funeral Home Chapel. Burial will be in the Grand Island City Cemetery. 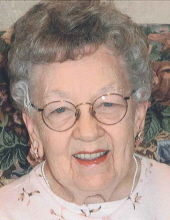 Lora was born on April 17, 1921 in Grand Island to Lewis and Nora (Woodward) McKenzie. She attended school and graduated from Grand Island Sr. High in 1940. Immediately following graduation she was united in marriage to her high school sweetheart, Dale D. Findley. They lived with her parents for a few years at which point Dale enlisted in the U.S. Navy during WW II. Lora continued living with her parents until his discharge and they built a home next door. Lora was a homemaker and very involved in her children's lives. She served as a den leader for Cub Scouts and also a Girl Scout leader for both daughters. Lora then served as an area trainer for leaders of the Goldenrod Girl Scout Council. She was also a very active member of the PTA at Jefferson Elementary School. Lora entered the workforce in the mid 50's in the credit department at Wolbach's Department Store and worked her way up to Credit Manager. In l960 she joined the First National Bank in the bookkeeping department and eventually became Manager of that department and was appointed as the second female bank officer. She remained with the bank nearly 25 years and went through two different bank acquisitions. Lora retired on December 31, 1985 due to her husband's health. Dale passed away on October 15, 1986. After Dale's death Lora took her brother Harvey in and cared for him until he needed skilled nursing. A short time later she took her sister Myrtle in and cared for her a few years until she needed skilled nursing. Caring for all of her family was a high priority, whether it be through time, finances, emotional support or words of wisdom. Lora lived her faith and was a life-long member of St. Pauls Lutheran Church, having taught Sunday School and sang in the choir for many years. In 2004 Lora moved in with her son Jim and wife Sharon. In August of 2010 she moved to Matelyn Retirement Community in St. Paul. In January of 2012 she moved to Country House in Grand Island and in December 2013 she was moved to her current home at Good Samaritan Society in Wood River. Lora spent her life being active in golfing, bowling, camping with her family, raising flowers which she dearly loved and collecting music boxes. She graduated from the Dale Carnegie Course on Effective Speaking and Human Relations and became a Graduate Assistant in the following year. Lora was a 43 year member of BPO Does Drove #147 in Grand Island. She served as President in 1981 and 1996 and was a 10 yr. Treasurer. She attended many Grand Lodge conventions with her daughter Carol, traveling to many states. Lora was preceded in death by all her siblings: sisters, Cecile "Irene" McKenzie, Myrtle Eberly; and brothers, Angus, Louis, Harvey, and George; grandsons, Robert Dale Ross and Roger Wayne Ross; a great granddaughter, Aubree Faith Inness; and a daughter and son-in-law, (Gale) Jean and Ronald Ochsner. She is survived by her children, Jim (Sharon) Findley of St. Paul, Carol (Jerry) Fanta of Dannebrog, and David (Janne) Findley of Grand Island; 21 grandchildren, 48 great grandchildren; 16 great-great grandchildren; and many nieces and nephews. Memorials may be made to St. Pauls Lutheran Church or to the family for designation at a later date. Online condolences may be directed to www.livson.com. Livingston-Sondermann Funeral Home is entrusted with arrangements. To send flowers or a remembrance gift to the family of Lora Mae Findley, please visit our Tribute Store. 3168 W Stolley Park Rd. "Email Address" would like to share the life celebration of Lora Mae Findley. Click on the "link" to go to share a favorite memory or leave a condolence message for the family.